Don’t miss this one of a kind showing of “The Best of Sand and The Giants of Off-Road”, premiering the UDS 4×4 Challenge and including over 250 of the industries finest companies from across the nation, all offering AMAZING show specials on Extreme 4×4’s and Lifted Diesel Trucks, Sandrails & Dune Buggies, Rhinos & Side x Side’s, Motorcycles and ATV’s, Trailers & Toy Haulers, Parts & Tools, Accessories & Apparel, and so much more! The 8th Annual Extreme Motorsports Expo opens on Friday at 5:00pm. Come and celebrate our 8th year @ The O.C. Fair & Events Center for FREE!! Tell your friends and bring your family out for an unforgettable evening of excitement, while helping to support a good cause. 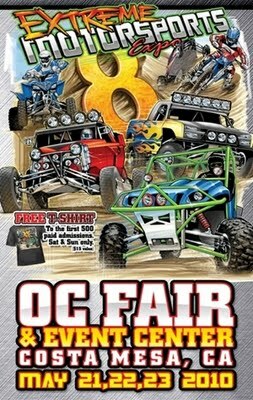 Admission to the event is FREE to all attendees on Friday, May 21st who print out a coupon off the website www.ExtremeMotorsportsExpo.com and donate three cans of food to benefit the Second Harvest Food Bank of OC. Come back over the weekend and be a part of the biggest event giveaway in history. The 8th Annual Extreme Motorsports Expo will be handing out a grand total of over $340,000 in FREE GIFTS to early attendees on Saturday & Sunday!!! Come Early – Stay Late! Ticket Boxes open @ 9:00am, with the gates opening @ 10:00am on Saturday & Sunday. Be one of the first 500 paid adults and receive a FREE gift certificate for the Ride of your life in a NASCAR race car at L.A. Racing (valued @ $299), a FREE All-Day park pass to any one of six Hollywood Sport Paintball Parks in Southern California (valued @ $25), and a FREE Event T-shirt (valued @ $15). With hundreds of exhibits, FREE Shows, FREE Demos, FREE Drawings & FREE Early Bird Gifts, the 8th Annual Extreme Motorsports Expo is on Full Throttle for another exciting year at the O.C. Fair & Events Center in Costa Mesa, May 21 – 23, 2010. Tickets are on sale now at Ticketmaster.com or any Ticketmaster Outlet. Visit www.ExtremeMotorsportsExpo.com or call (714)241-9055 for more information.